I colored my image with Prismacolor pencils & mineral spirits and paper-pieced the hearts. Papers are from My Mind's Eye - I added a ribbon and kept it pretty simple. Have a great weekend! Peace. Stacie here with today's Digi My World post! I just love this whole set of Pip Squeaks! They are all so adorable! I used one for my project today! I accidentally cut off his cute little tail when I was fussy cutting him so I made him a new one! I used a stamp from Paper Smooches to make him a cute little Valentine's tail! I cut the mat from an SVG Cutting file card base & added the doodled stitching with a file from the Silhouette store. Copics to color him up. Larelyn here from Handmade From My Heart. Did you enjoy the new release? So many adorable images for your Valentine cards and treats!! Today I'm sharing a file that's been in the Digi My World store for awhile called Love Bandit. I've had the papers in my Valentine stash for quite awhile. I colored the image with Copic markers, added some twine and hearts using Jaded Blossom's Valentine dies. The sentiment is from the Forest Friends set also from Jaded Blossom. Hello everyone! 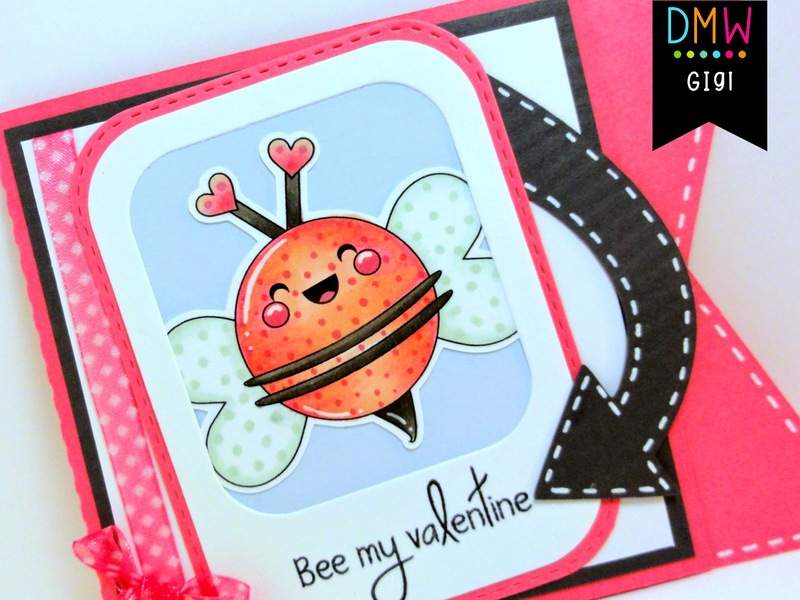 This is GiGi from The Cricut Bug and I have a fun card to share with you using the Bee Mine digital stamp. 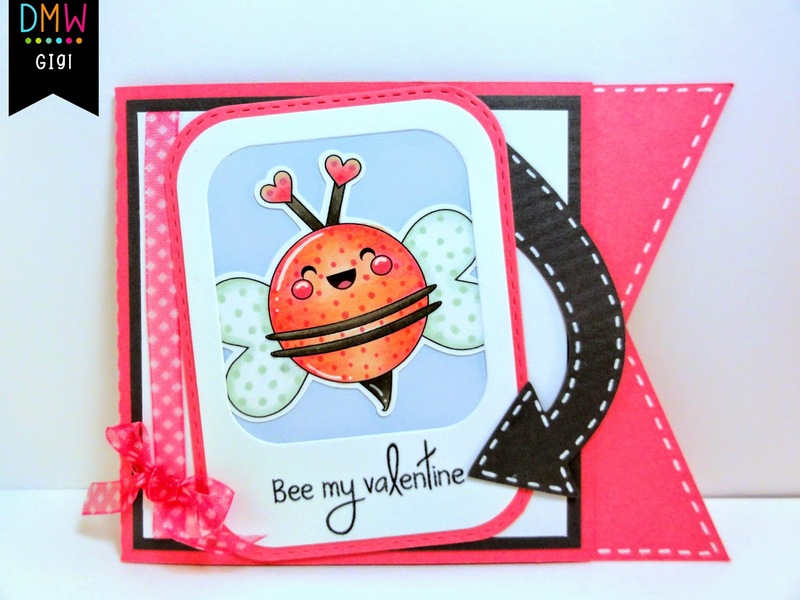 This Valentine Bee is so super cute! I just love his happy face! I started this card with the SVG Cutting Files On The Edge Flag Card Base. I added a stitching line with a white gel pen to the flag end and also to the arrow that was cut using the Tons Of Arrows cut file. I printed and cut out the Bee Mine bee using my Cameo and colored her with Copic Markers. I added her to a light blue mat and added the die frame over the top cut with the Jaded Blossom Layered Frame and Journal Die. To finish, I added a ribbon to the side and stamped the sentiment from the Pugs & Kisses stamp set. 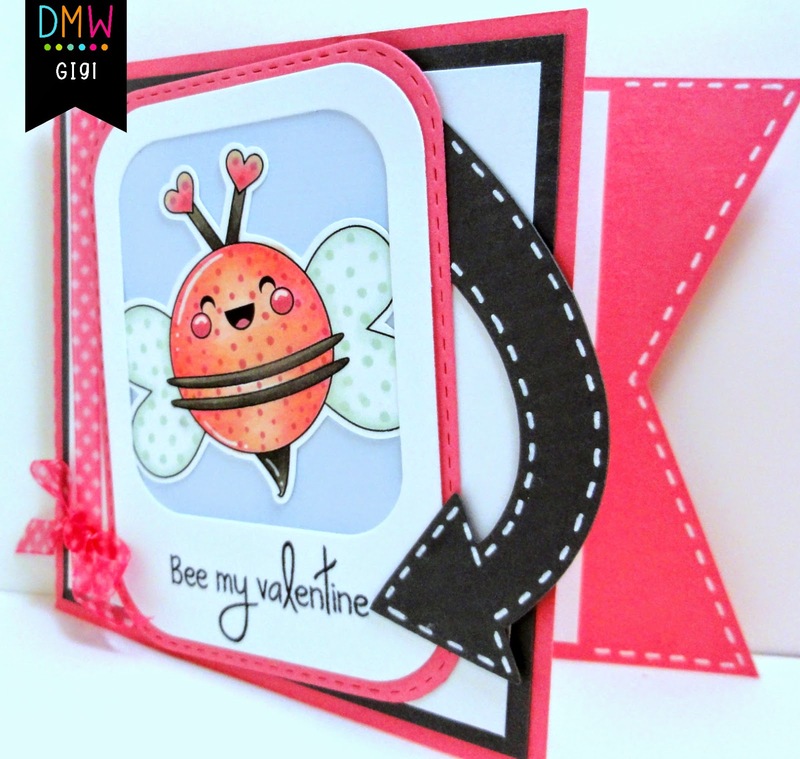 Welcome to the Digi My World BE MINE digital stamp release! All week long we will have some wonderful inspirational project to share with you! 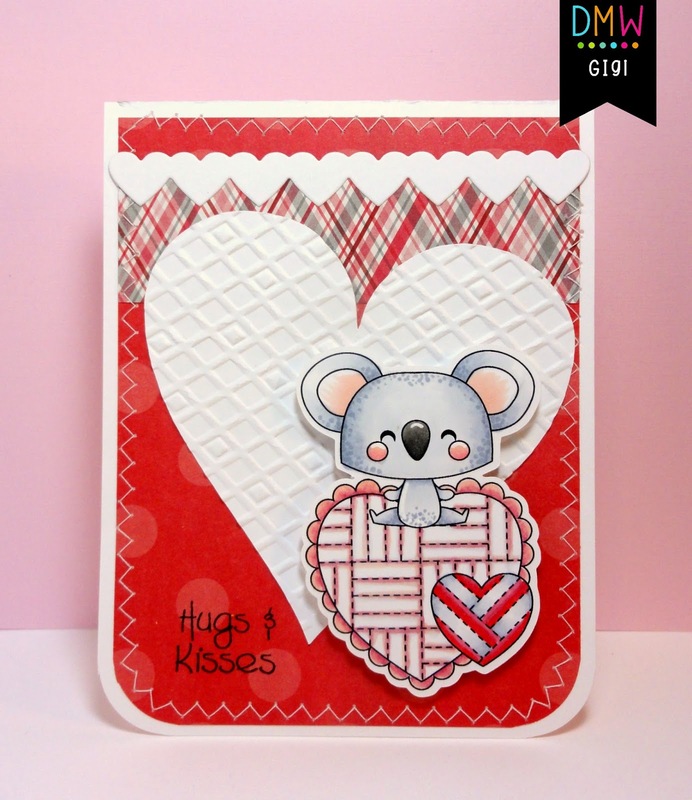 my project today is... A super cute Koala Valentine card! I have to tell you all....I LOVE these new V-Day Digital Stamps! There are some seriously cute images being released TODAY!!! 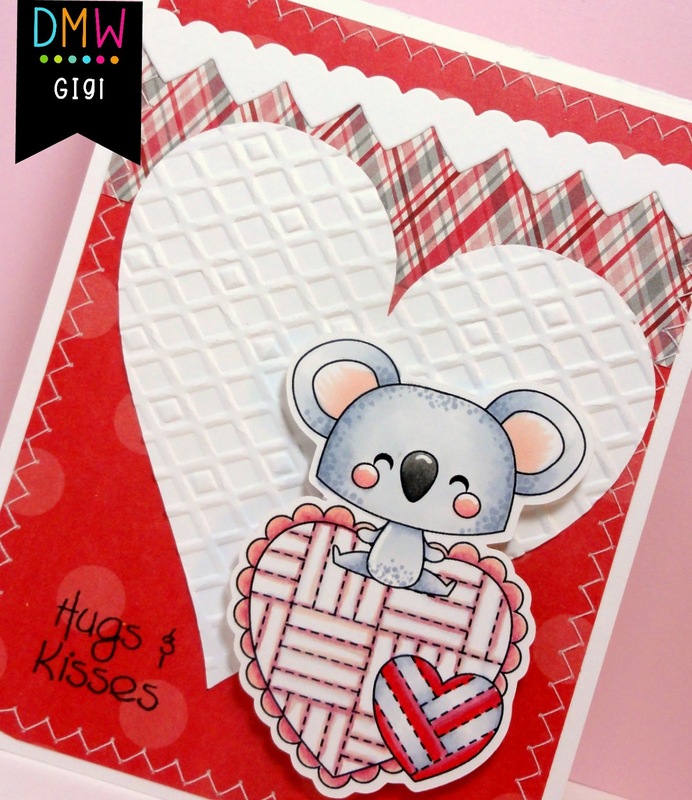 I decided to show the Valentine Card that I made using the NEW V-Day Koala. I printed and cut out the Koala with my Cameo and colored him with Copic Markers. I also cut a heart for in the background and embossed it with the Sizzix Diamonds embossing folder. I used my sewing machine to stitch around the card and added a row of die cut hearts from the Jaded Blossom Valentine Dies. To finish, I stamped the sentiment from the Valentine Treats stamp set. 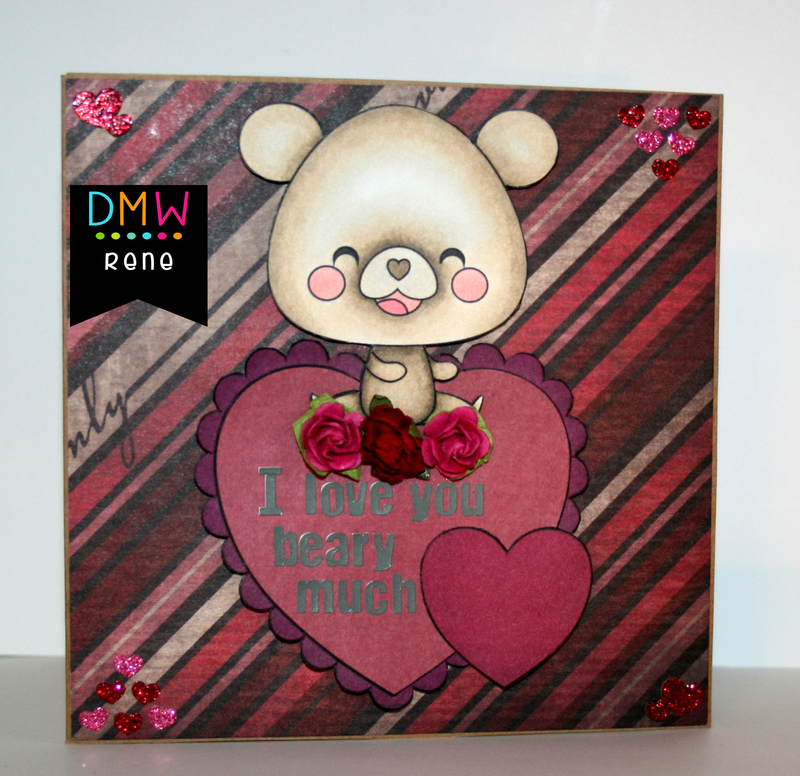 Here is my creation using the adorable VDay Bear! Each day we will pick one random winner from the comments made on the blog! This is Sandy here from A Little Piece Of Heaven! My Project today is... this fun fox fold shaped Valentine card! I love how simple this was to make! If you are interested in this fold, you can find it here! I used Memory Box,Corner Bow, and then added a gem! In the top corners of the card, I just cut the swirl from the same die and added Stickles, Crystal! The cute little fox image was colored with Copics! I then used a white gel pen to add the little stitching to finish it off! Every new release image you have seen so far will be available on Friday in the DMW Store! There will be plenty more that you haven't seen as well, so be sure and go and check it out! Come join the EVENT with us on Facebook as well! Come back tomorrow for another preview of another fun new release! All week long the designers will have some inspirational projects to share with you. Mel here from Doxie Mel Designs with a new card for you today. So many adorable digi stamps to color.. I picked one of the sweet foxes. He is colored with Copic and Spectrum Noir Markers. You may enter everyday if you wish, the more you enter the more chances to WIN! The winner will receive one of the new stamps and be picked randomly. 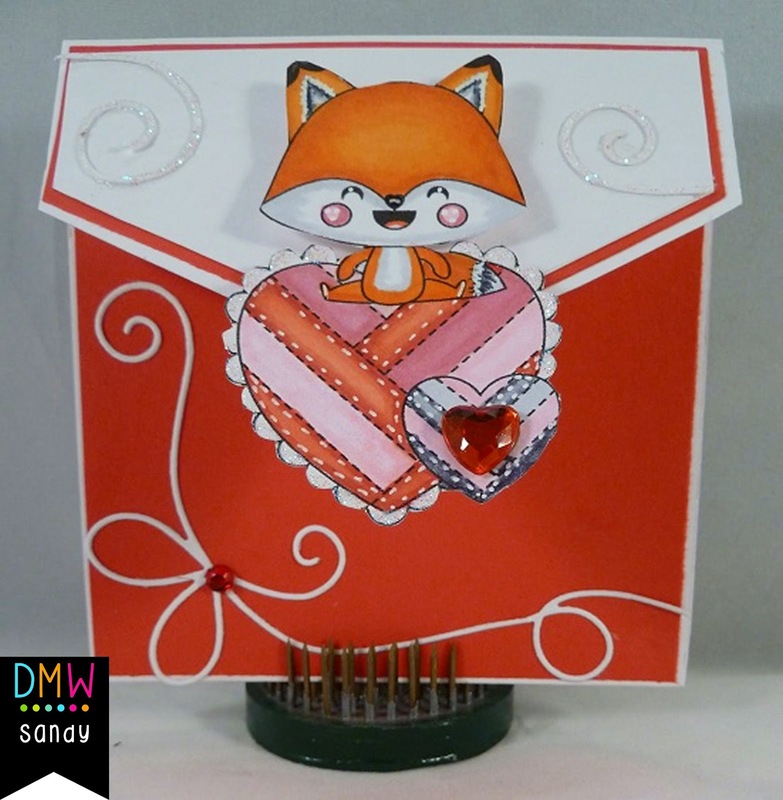 Hello everyone andwelcome to the Digi My World BE MINE digital stamp release! All week long we will have some wonderful inspirational projects to share with you! I am Audrey from the DT and I get to share my creation with you today. This is my first post here on the Digi My World blog and I am just thrilled to be part of the fun here and being able to work with Ann's amazing digis. My Project today uses Valentine's Day Giraffe from the BE MINE Collection. Such a fun image and just perfect for all different sorts of projects. I went with a Valentine card this time around. Colored the image with Copics and added Stickles for the lace edge of the heart. Image cut with Tonic die. I sure hope you like it! 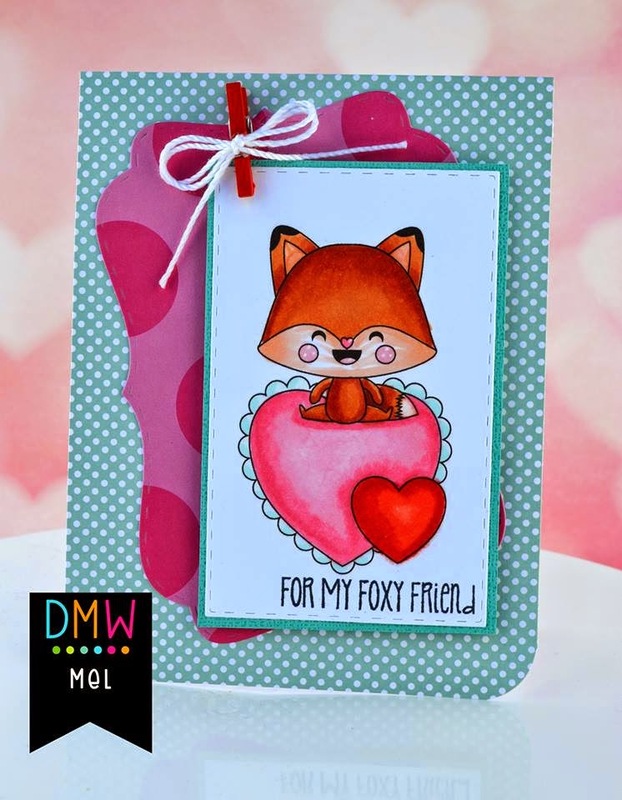 Remember the release will be in the Digi My World Shop on Friday, but the DT will be previewing images all week, here on the blog, on our own personal blogs and on Digi My World BE MINE Release Facebook Event. Hope you will come check out everything we have going on and see all the wonderful releases!! 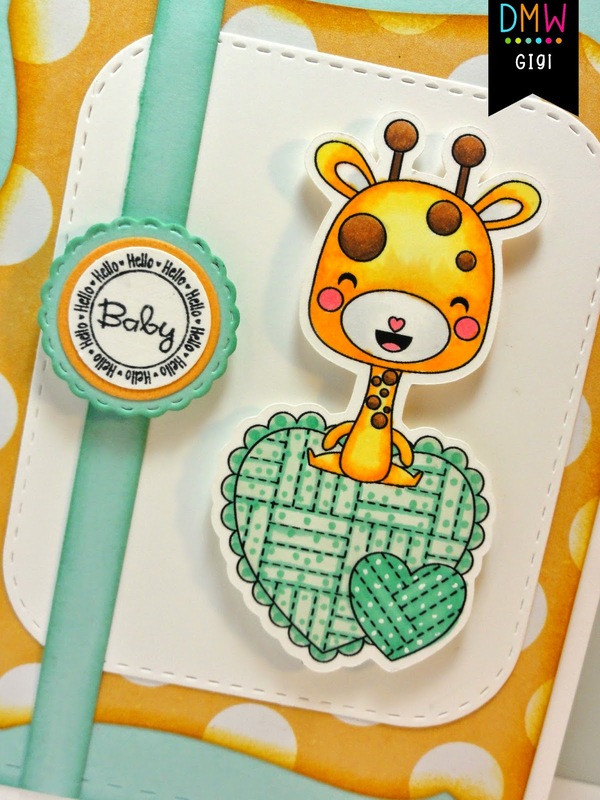 my Project today is...This super cute giraffe baby card! I chose to make a baby card instead of a Valentine to show just how cute these NEW V-Day Animal images can be besides for Valentines. I love this card! It is so cheerful and just screams baby! I kept the colors neutral for a boy or girl. I printed and cut out the V-Day Giraffe with my Cameo and colored him with Copic Markers. I added him to a mat cut with the Jaded Blossom Layered Frame and Journal Dies on pop dots and added a strip of paper over the side. I cut the background mat with the JB Card Mat Dies and inked all the edges. The circle sentiment is stamped from the Hello Candies stamp set and I matted it to a scallop circle cut with the Mini Tag Dies 2 die set. Make sure to come back and check out the Digi My World Blog all week long for projects using all the NEW images. Hey Stacie here! This is my first post as a DT member for Digi My World. I just love Ann's digi stamps! They are all so adorable! 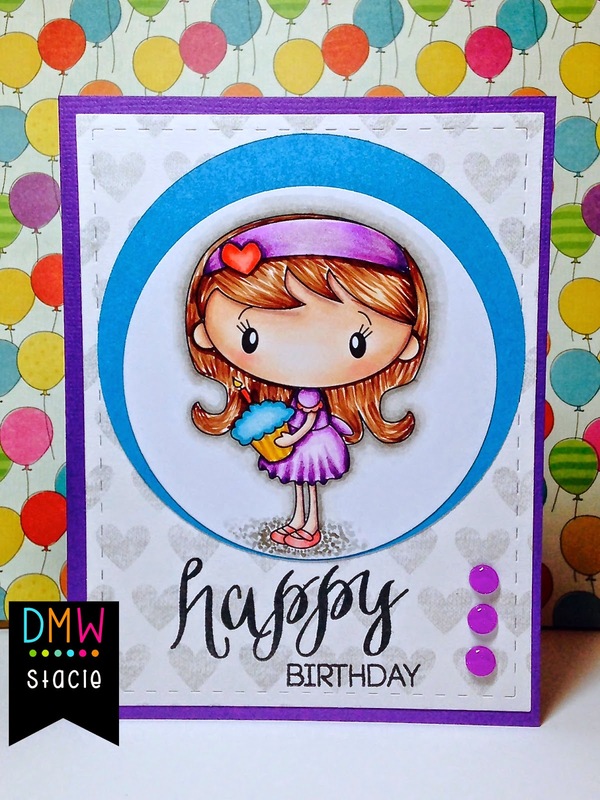 For my first post I wanted to use the adorable Chibi Birthday Stacey to make a card for my niece. It's Larelyn from Handmade From My Heart. I hope you're enjoying meeting our new designers. 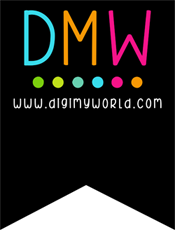 2015 should be a great year for Digi My World with new design team members, new releases, and other fun things coming your way. For my first post of 2015 I'm using an image from Stella's Valentine. I've used Copic Markers to color the image and papers from DCWV's Luxury Stack. I loved that my doily matched the color I had selected for the teacup (I usually select my papers and embellishments first, but not this time). The sentiment is from Jaded Blossom's Java Time set stamped on a Mini Tag Die. A Twine bow and sequin finishes the project. Hello everyone! This is GiGi from The Cricut Bug and I am sharing this cute Valentine card. 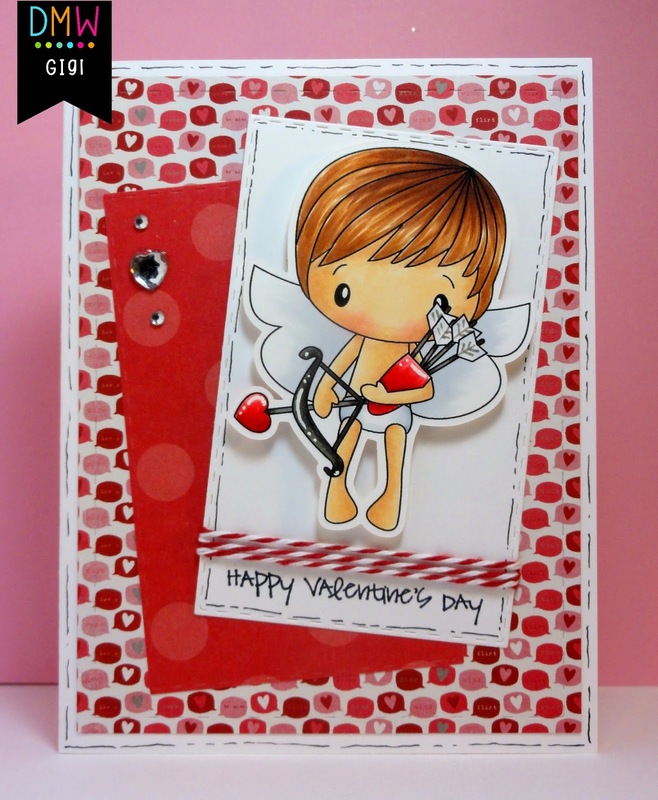 I used the Cupid Cloud Digital Stamp set for that adorable cupid boy. 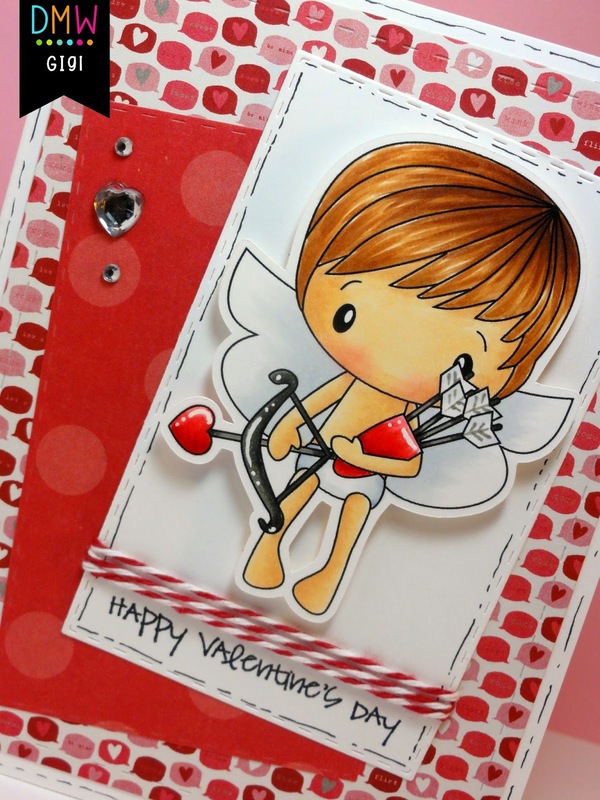 This turned out so cute and the cupid was super fun to color! I started this card using a standard A2 card base and added the mat layer using the Jaded Blossom Card Mat Dies. I printed and cut the Cupid In Cloud boy and colored him with Copic Markers. I added him to a mat that I cut using the Jaded Blossom Goody Bag Die mat layer and used a black pen to add the outline. I also added some twine and stamped the sentiment from the Sprinkled With Love stamp set. I printed my image on some text patterned paper, then colored it with Prismacolor pencils & mineral spirits. The playing card paper is an old one from Stampin' Up! I'll see you again next Monday! Peace. Rene here with the Thursday post for Digi My World! First let me say how excited I am to be a part of this fantastic team! I have LOVED DMW images for so many years that I am just over to moon to be part of the design team! Here is my first creation...a sweet little Get Better Soon card using one of the images from Apple Picking Time! An apple a day keeps the doctor away, right? Thank you so much for checking out my project! I decided to get my first Christmas card made so I will be one ahead that I won't have to hurry and be last minute on when I need it! The image is one of the kids from Winter Kids, found at the Digi My World Store! I just love this set! Look at how many wonderful images it comes with! I hope today's post inspires you! Hello! Mel here with you today with a new card. I just love this Proud Bug! I like to call him Super Love Bug because of the way he is standing. He is actually called "Ladybug Love" and you can pick this cutie up at the the Digi My World Store.